I've had a lot of questions lately about facebook timeline apps and were to find them and how to use them. There are so many great options out there and it seems like everything has an app now. I want to share with you my favorite app and show you just how easy it is to customize your timeline. We're going to install a Woobox app. Just click that link and follow the instructions in the slideshare. It's super fast and super easy and your page will make you look like a rockstar! View more presentations from Kelly Sorenson. Of course I have to plug my design services... I do offer custom timeline design which includes custom app covers OR I also have 11 ready to go app covers. 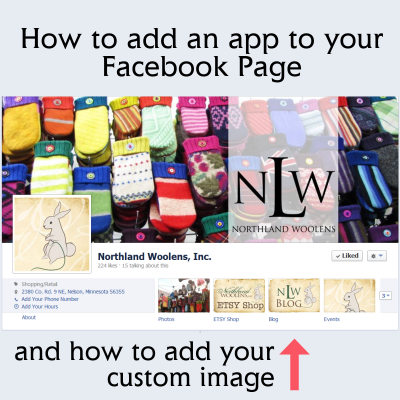 Shout out to Northland Woolens for letting me use their facebook page to create the tute! Go give their facebook page a LIKE and tell them how much they rock! I also wanted to let you know I added a new page to the blog for all the tutorials. There are two there so far and more in the works. If you have a question or an idea for a tutorial, head over there and leave me a comment! If you liked this post, please share it with your friends using the social media icons below :) I'll love ya forever if you do!